JOYRIDERS are at it again on the Coffs Coast as they continue to inflict misery on local families. Two cars in two days have been discovered dumped and torched at the idyllic Micks Retreat at Sawtell, frustrating the car owners, police investigators and the fire crews called to douse the flames. In the latest incident, a Ford Laser suspected of being stolen was found smouldering at the spot by an early-morning walker at 7am yesterday. The fire had also spread to nearby fence posts and scrub. Another car was stolen, dumped and torched overnight. This time it was a white 2004 Mazda van, which thieves had their eyes on in Coffs Harbour’s Manning Avenue. They stole the vehicle some time between 9.30pm on Thursday and 3am yesterday. 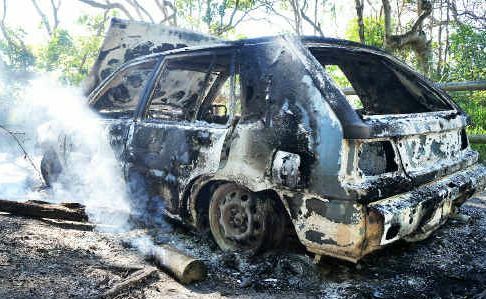 At 5.30am passers-by found the van on fire in Star Creek Road, Coramba. Rural Fire Service crews were called in to extinguish the flames, but they were unable to save the vehicle. On Wednesday night, thieves pounced on a blue 2002 Kia van parked outside a mechanical workshop in Coffs Harbour’s June Street. They stole the people mover some time after 5pm and dumped and torched it at Micks Retreat. Elsewhere, hoodlums torched a broken down vehicle on Orara Way south of Glenreagh overnight on Wednesday. A Glenreagh man, 35, had left his white 2000 Kia tabletop ute on the side of the road, but returned the next morning to discover it had been destroyed by fire. If you can help with the investigations into these crimes, contact Coffs Harbour police on 6652 0299 or Crime Stoppers on 1800 333 000.